Size of this preview: 750 × 600 pixels. Other resolutions: 300 × 240 pixels | 600 × 480 pixels | 961 × 768 pixels | 1,203 × 962 pixels. English: Map of the Solomon Islands as of 1989. Province names are included, except for two new provinces as of 1995: the Rennell and Bellona Province (formerly part of Central Province) and the Choiseul Province (formerly part of Western Province). Source Solomon Islands (Political) 1989 from Perry-Castañeda Library Map Collection: Solomon Islands Maps. Cropped to remove white space from edges of map. 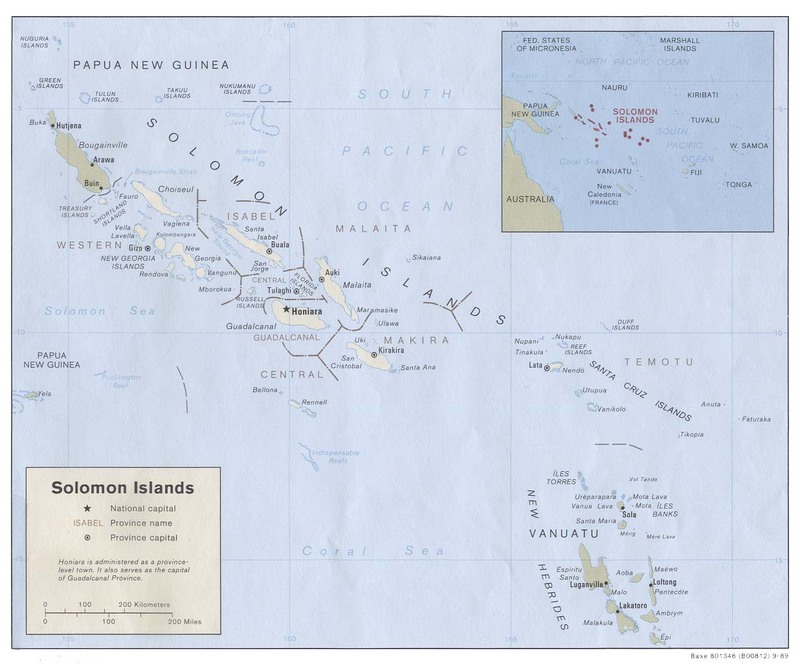 This image is a copy or a derivative work of solomon_islands_pol89.jpg, from the map collection of the Perry–Castañeda Library (PCL) of the University of Texas at Austin.